While yesterday’s post was still hot off the presses, Palmeiras confirmed the signing of centre-back Victor Ramos. The player, currently at Monterrey (Mexico) will undergo medical exams before joining the squad, as a loan, until the end of 2015. At Palmeiras, the 25-year-old will face competition from Wellington, Thiago Martins, Gabriel Dias, Tobio, Nathan and Vitor Hugo. Alan Patrick – the offensive midfielder started his career at Santos, in the same batch that brought us Neymar and Ganso. His economic rights belong to Shaktar Donetsk of Ukraine, although he played last season for Internacional of Porto Alegre. Passing medical exams, he will join the squad – either on loan or as a purchase. To be confirmed. 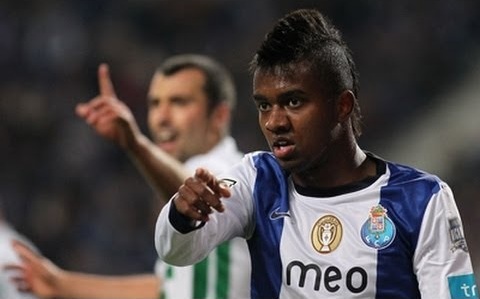 Kelvin – the 21-year-old forward comes as a loan from Porto (Portugal) until the end of the year. In Brazil, Kelvin only played for Paraná before his early transfer to Europe. At Porto he made history by scoring the decisive goal against Benfica in the game that gave Porto the 2013 championship title. Kevin is fast and works his magic predominantly on the right flank: it’ll be interesting pairing him up with Dudu up front, with Valdivia (or Robinho) and Zé Roberto feeding them balls to work on. Reportedly, Palmeiras are also negotiating with centre-back Jackson, belonging to Internacional but who played for Goiás last season. Palmeiras and Jackson have agreed on terms and apparently Inter, this afternoon, gave the deal – a one-year loan – its blessing. Stay tuned. Finalizing, there’s Aranha. The competent Santos keeper yesterday followed Arouca’s example, seeking to be released from his contract due to unpaid wages. Likely destination? You got it. With all this activity, no wonder Palmeiras’ membership programme AVANTI has skyrocketed: today, Palmeiras passed both Corinthians and Cruzeiro. With some 68.000 members and counting – more than a thousand 2370 new members only today – Palmeiras now has the third largest supporter programme, trailing only the two largest clubs from Porto Alegre: Grêmio (80K) and Internacional (128K). Next Starting on a right foot… But not for Mouche. Maybe the return of Barcos could be interesting… but I doubt that. I still think a STAR #10 should arrive though, someone like Conca or Xavier, or even Ribeiro (all rumoured, but dificult aquisitions) would take the team that extra step turning it from a “VERY Competitive team” to a “Fearful side to face” making Palmeiras once again become not “one of the possible favorites” but “ABSOLUTE Favorite”. In terms of marketing and Self-steem, it would be terrific, and I´ve heard say that Mattos really wants such a signing. If not now, than at least at the next transfer window I´d love to se something like that go down. Just want to say that I’m really enjoying this site. It’s been so difficult to find English-language information and views on Palmeiras so this is a great discovery for me! MJ, thanks for taking the time and leave your comment. Greatly appreciated! Happy you’re enjoying Anything Palmeiras: hope you come back often (alias, later today there will be fresh news). Cheers! You’re welcome, I’ll definitely be back for that. Thanks!